The truth is, they’re all false! 1. Contact lenses are safer than LASIK. FALSE First reported in 2006* and confirmed many times,** wearing contact lenses long-term has been found to carry a higher risk of loss of vision than having advanced LASIK by an expert surgeon. In a 2016 study, compared to long-term contact lenses, advanced LASIK was three times better*** in terms of eye comfort and better than 20/20 vision with no long-term differences in glare, halos, starbursts or dry eye symptoms. 2.) Contacts are less expensive than LASIK. FALSE For a 29-year-old, the expected lifetime cost of disposable contact lenses is $29,200+, and factoring in the cost of backup glasses, can be higher. LASIK vision correction is a fraction of this cost. Calculate how much money you could save here. 3. After LASIK, glare and halos often cause poor night vision. FALSE The results of a very large joint research study~ involving the FDA, Department of Defense and the National Eye Institute showed that symptoms such as ghosting, glare, halos, and starburst did not increase after LASIK. In fact, patients with ghosting actually decreased from 33% before surgery to 6% after surgery. 4. LASIK can’t correct astigmatism. 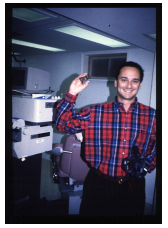 FALSE Astigmatism has been very successfully treated with the excimer laser since it was approved by the FDA in 1997. Even high astigmatism (6 diopters) can be well treated and is FDA-approved. 5. Eye doctors don’t have LASIK on their own eyes. Dr. Rubinfeld after laser vision correction procedure. FALSE Eye doctors who specialize in performing laser vision correction are four more times likely` to have their own vision corrected than the general public. Doctors who had laser vision correction described better quality of life` with 39% reporting their ability to perform medical procedures accurately had improved compared with their glasses or contact lenses. 6. People with large pupils or thin corneas can’t safely have LASIK. FALSE Many studies^ have shown this myth about pupil size “is not supported by modern studies” as per the American Academy of Ophthalmology. As well, several studies% have shown that most people with thinner corneas can now safely have vision correction. 7. You can’t have LASIK if you serve in the military or law enforcement. FALSE Well over a decade ago, the US military approved LASIK for active duty combat personnel. In fact, Dr. Rubinfeld has performed laser vision correction on many members of our armed forces including F-16 jet fighter pilots and Navy SEALS. 8. LASIK is still new so we don’t know its long-term results. FALSE The US FDA approved excimer laser in 1996. Over 20 years of study and experience have shown laser vision correction to be among the most commonly performed and most well studied elective procedures in the world. Dr. Rubinfeld had his laser vision correction in 1995 and performed LASIK on his wife in 1998; they continue to see well – and are still married. 9. LASIK often causes dry eye problems. FALSE Recent research suggests that contact lens wear may cause chronic dry eye problems# that, with expert patient selection, many patients have fewer dry eye symptoms after expert LASIK than they had with their contact lenses. 10. LASIK makes you need reading glasses sooner. FALSE As people with excellent distance vision enter their 40s, they naturally develop the need for reading glasses. LASIK does not cause the aging process to occur faster. There are often good options to reduce the need for reading glasses into your 40s and beyond. 11. LASIK surgeons are all the same so it is best to find the best "deal". FALSE All LASIK surgeons are not the same. If you were considering brain or heart surgery, would you really be looking for the “best deal”? Your vision is precious so it is essential to find a surgeon you can trust with the very best expertise. Dr. Rubinfeld is a leading LASIK surgeon who has been profiled on ABC7, NBC4, The Washington Post, Washingtonian Magazine, to name a few, and frequently lectures around the world. 12. LASIK consults are expensive and take a long time to hear back about results. FALSE At Re:Vision - Roy Rubinfeld, MD, LASIK consults are free and can take as little as 45 minutes for the visit and to find out if you are a candidate from the surgeon himself. Peer review is the highest form of scientific literature that has passed review by other experts. Citations for the research presented in this quiz are below. Find a printable PDF of this quiz with citations to all of the facts here.